The recently released World Bank's Ease of Doing Business (EoDB) ranking recorded a jump of 30 places for India. The country is now amongst the top-100 countries, out of the 190 nations surveyed. It is worth noting that India is the first ever country to record such a highest jump in the ratings! India has shown the highest jump in rank among all countries this year. By definition, the EoDB index ranks 190 countries based on the 10 indicators that carry an equal weight. These are: Protecting Minority Investors, Getting Credit, Getting Electricity, Resolving Insolvency, Paying Taxes, Trading across Borders, Registering Property, Starting a Business, Enforcing Contracts and Dealing with Construction Permits. India is ranked fourth in terms of Protecting Minority Investors in 2018. Further, the country ranks 29th in terms of Getting Credit as well as Electricity. In fact, India has shown improvement in most of these indicators as compared to 2017. For instance, the Indian economy has improved its spot to 103 in terms of Resolving Insolvency, one of the most promising indicators, which was 136 in 2017. Further, the biggest jump of 53 places is displayed in the Paying Taxes index, by moving up to 119th spot, owing to India’s fast progress in tax reforms. This rating is not a surprise! Indian Government has been consistently undertaking positive growth-oriented steps to achieve it. Few of these are an extensive exercise in terms of stakeholder consultations, identification of user needs, government process re-engineering to match rules and procedures with user expectations and streamlining them to create a more conducive business environment. Going by the World Bank, the ‘Doing Business’ Report 2018 gives credit to the Modi government for taking several positive measures. For instance, the Report mentions that the Government recapitalised Indian public sector banks by pumping in funds worth US$ 32 billion. This was done by issuing recapitalisation bonds as well as through the budgetary support. This eased the credit availability situation spurred investment in important infrastructure as well as power projects. At the same time, India also initiated 37 reforms in the areas of insolvency resolution, protecting the interest of minority shareholders, and simplifying the process of taxes. These measures, as the World Bank report states, led to India’s boosted ranking. Reforms to ensure the faster resolution of commercial disputes could further improve India’s ranking in future surveys. World Bank’s Chief Executive Officer Crystalline Gergiev has complimented India on its commendable performance in the Doing Business 2018 Report. He accredits this triumph to the Indian Government’s resolve to take tough decisions that have translated into noteworthy progress. India is one of the top five reformers, improving its score in six out of ten criteria used by the World Bank for measuring the ease of doing business. Considering the size of India, this progress has been phenomenal, adds Gergiev. The Government of India has also reinforced the access to credit by simplifying the rules on priority of secured creditors outside reorganization proceedings. It has also embraced a new insolvency and bankruptcy code that brought a reorganization procedure for corporate debtors. In trading across borders, India has lowered the border compliance time by boosting infrastructure at Mumbai’s Nhava Sheva Port. The country has also fastened the process of obtaining a building permit. This was accomplished by implementing an online Single Window System for the approval of building plans. This new system now allows for the submission and approval of building plans prior to requesting the building permit. The Government of India has also simplified the process of business incorporation by introducing the SPICe form (INC-32). This form effectively combines the application for the Permanent Account Number (PAN) and the Tax Account Number (TAN) into a single submission. Further, with the improvements to the online system in 2016, procedural delays also reduced for the employees, in terms of the time taken to complete the applications for Employee's Provident Fund Organization (EPFO) and the Employee's State Insurance Corporation (ESIC). The ‘Doing Business’ report also mentions that the joint application for the Mumbai Value Added Tax (VAT) and the Profession Tax (PT) has come into effect in entirety by January 2017. Procedures have been simplified in 2017 for exporters and importers. For instance, export and import border compliance costs were also lowered in Delhi and Mumbai after abolition of merchant overtime fees. With the rise in use of electronic and mobile platforms since July 2016, the importers have been able to clear cargo faster through simplified customs procedures, under the Authorized Economic Operator (AEO) program. Another significant step taken by the Indian Government has been to initiate the Bankruptcy and Insolvency Act, 2017. After the Act’s execution, it will become easier for companies to exit the business or even to revive it, if required. At the same time, it will also lessen the non-performing assets (NPAs) burden for the country’s financial services sector. As we understand, this will automatically simplify the process for banks and financial institutions to deal with NPAs arising out of failed corporate ventures. For the corporate sector, this shall help make the liquidation or revival or simpler and faster. Since big-ticket reforms such as demonetization, GST and the Banking and Insolvency Act were introduced after the coverage period for this year’s Doing Business Report, their impact will be felt in the 2019 report. India is now all geared up to be counted among the top 50 of the World Bank’s Doing Business rankings in coming years. Even the Indian Prime Minister Mr Narendra Modi expects India to be a part of the top 50 before 2022. To attain this goal, the Indian Government now plans to introduce vital reforms to land ownership, labor law, and the judicial process. In fact, India has already initiated many steps in this direction. With e-governance, a single window concept can be introduced where companies can file their application online for permission to acquire land, register property, get a construction clearance, etc. This will go a long way in improving the business climate. Another step in the right direction is that the Department of Industrial Policy and Promotion (DIPP) has already began undertaking its own much wider evaluation across all the major Indian cities. The idea is to calculate the economic progress divide between more progressive cities (like Delhi and Mumbai) and the lesser ones (like Aligarh and Meerut) and plan steps to bridge this gap. 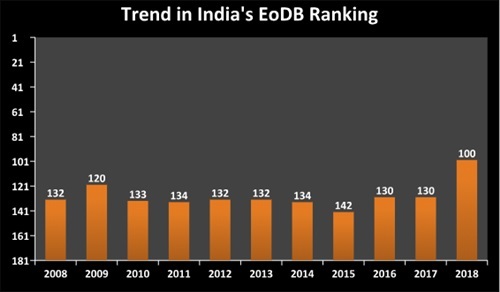 Finally, the EoDB ranking has reinforced the improving reform trajectory and is definitely an outcome of the all-round & multi-sectoral reform push. The huge improvement in ranking and score will also boost investor sentiment and is a result of initiatives like fast-tracking of economic reforms, addressing red tape and facilitating business.